It is some three decades now since a very talented local lady by the name Shirley Hibbert held patchwork classes at the local Adult Education Center. I wonder if she knew then, that all these years later, her inspiration is still strong and flourishing in Alexandra. Friendships forged then are still alive today, and the group has grown into an Incorporated body of fifty folk some travelling many miles to enjoy the creative comradarie which abounds. 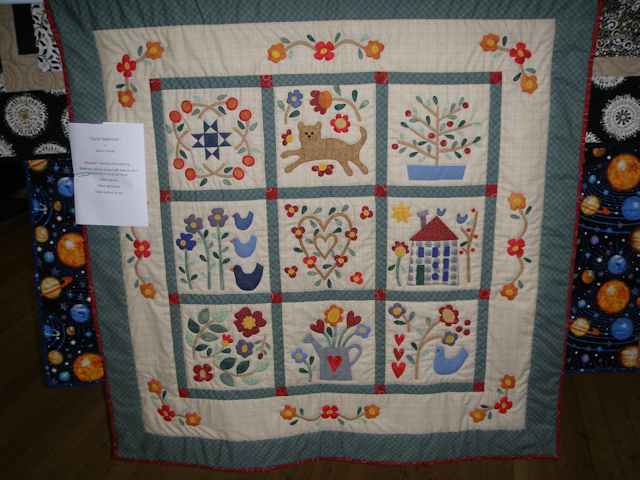 We are a not for profit Friendship Group that comes together to share the joy of Patchwork and Quilting. On the first Saturday and third Monday night of every month. For a small joining fee our ladies enjoy membership with Victorian Quilters Inc. a, the use of an extensive library, organised activities such as retreats and trips and participation in friendship rounds whereby we help each other to piece together a quilt learning new techniques as we go. Membership also gives the opportunity to join our Craft and Chatter Group on the third and fourth Friday of the month an join in with the Blossoming Buds, a craft group which meets each Friday in the Month.